“She's battered, she's bruised and she's quite possibly buggered," the MC announced in Li Na’s introduction to a packed Rod Laver Arena in Melbourne as she accepted the runners-up prize at the 2013 Australian Open. Li may not have taken a second major title, but she won the hearts of Australian fans with her skill, humor and fighting spirit. The Chinese star gave everything on Saturday in the final against the world’s number one ranked Victoria Azarenka. Despite taking the first set 6-4, Li lost the last two sets to the Belarusian and for the second time in three years finished second in the tournament Down Under. But that was not the full story. Li injured her ankle and also fell and banged her head during the match, calling a medical time out. "I was worried when my head hit the floor because for two seconds I couldn't see anything,” said Li afterwards. 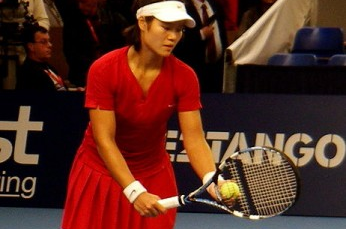 ESPN commentator and legendary former number one ranked American tennis player Chris Evert said that she couldn’t remember seeing anyone bang their head on a tennis court like Li did in the final. Cheered on by the Aussie crowd, the 30 year-old battled on, but was unable to prevent her opponent from successfully defending her title. Until the end, Li received the support of the local fans who cheered her every move, partly due to Azarenka’s choice to take a controversial medical timeout in her semi-final win over Sloane Stephens. Many felt she used the rule to gain an unfair advantage when she was struggling. Azarenka herself said she had a locked rib and was struggling to breathe. "It was necessary thing for me to do,'' she said. "I just regret that I didn't take it earlier. … It got to the point that it was pretty much impossible for me to breathe and to play. She continued, "The timing, yeah, it was my bad. The game before that, when I lost my service game, it kept getting worse. I thought I would have to play through it and keep calm. But it just got worse. You know, I had to do it." One positive for Li to take away from this year’s Australian Open is the reminder that when she lost the 2011 Australian Open final to Kim Clijsters, she went on to win the next major tournament on the international circuit that year–the French Open. After an indifferent 2012, Li certainly looks as if she means business in 2013. And it looks as if she enjoyed the Australian Open and the Australian Open enjoyed having her.